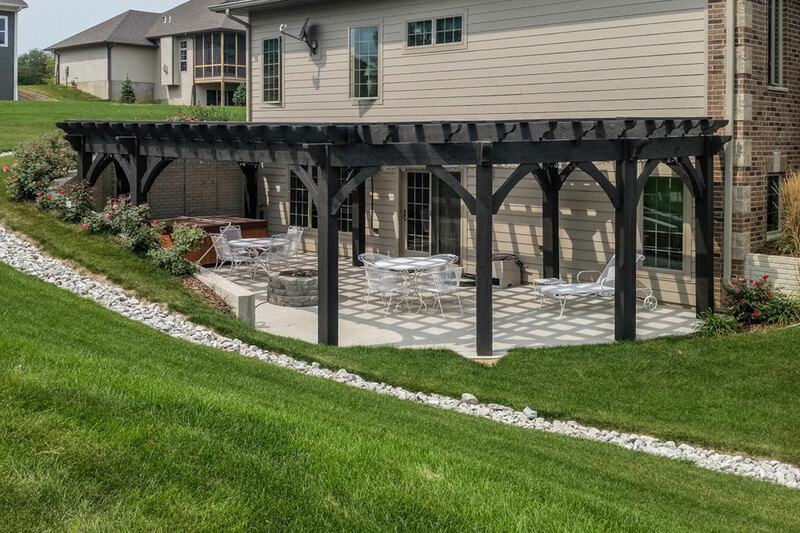 Corner view of the 20’x 20′, five post timber frame 8000 Series ShadeScape™ DIY pergola kit with lattices over backyard concrete patio. 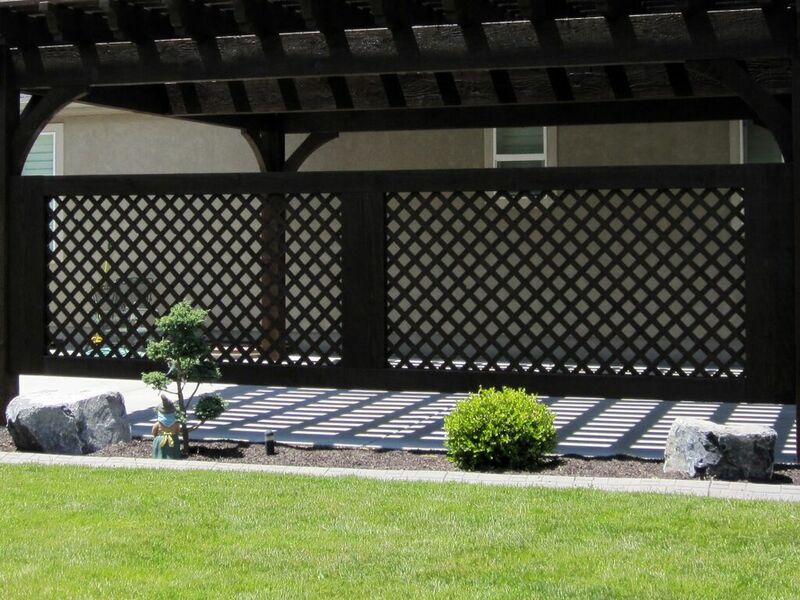 Giving the backyard patio some covering will extend the square footage of a home. The extra outdoor room gives a relaxed family atmosphere for activities such as cooking, dining and good conversations. 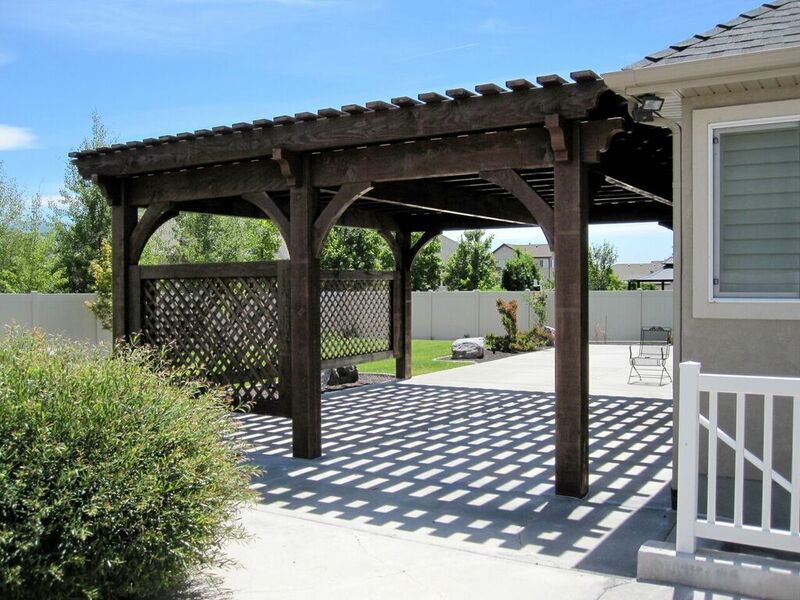 The intricate elegance and beauty of lattices are a popular design in outdoor shade structures. 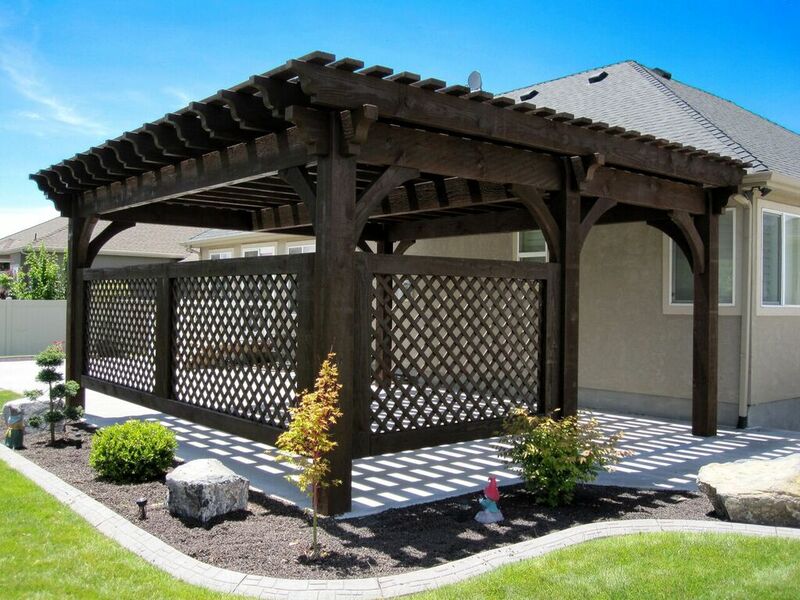 Next to a pool, over the patio or part of a garden, solid wood lattice work can define a space, give more privacy while providing wonderful additional shade. Climbing vines and vegetables can also be grown up over the lattice work. Sometimes lattices are used to display outdoor art and decorations. 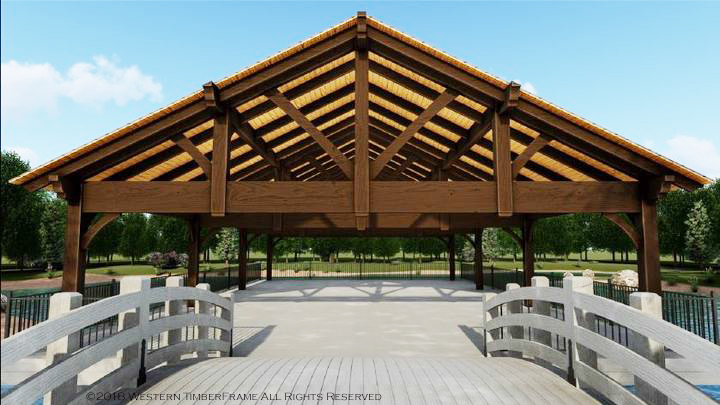 These heavy-duty, solid wood lattice works from Western Timber Frame™ are far superior to any of the wooden lattices found in the big box stores. They are thicker, heavier and so much stronger. It adds an awesome ambience of high-quality, custom old world craftsmanship, because that is just what it is. 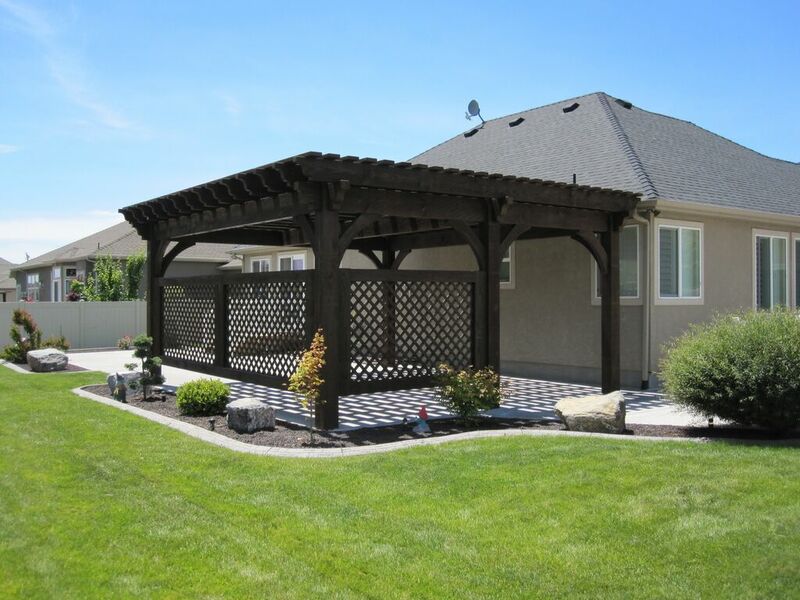 Side view of a 20′ x 20′ timber frame DIY pergola kit with 5 posts and lattices. 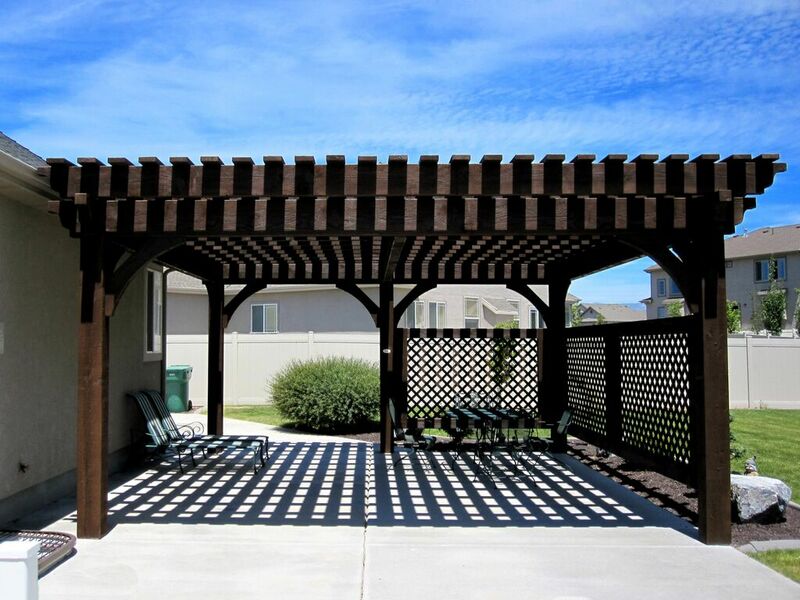 Lattices can be used for a pleasing shade roof design or added in between posts for a more contemporary styled pergola as pictured here. 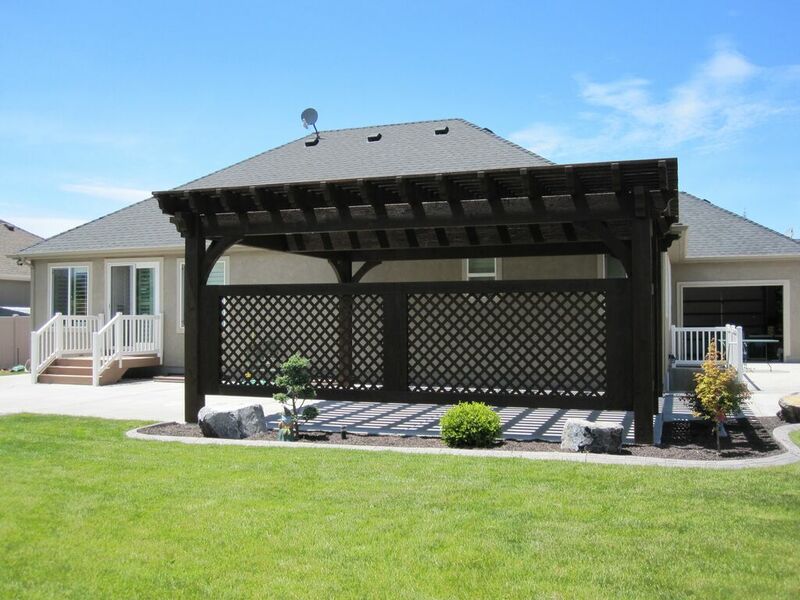 Featured today is a 20′ x 20′ ShadeScape™ 8000 Series solid wood DIY pergola kit featuring Classic style knee braces, five posts, three heavy-duty lattice panels, Champion style beam and rafter end profiles, finished in a premium high-grade, UV protective, Rich Cordoba exterior wood stain. 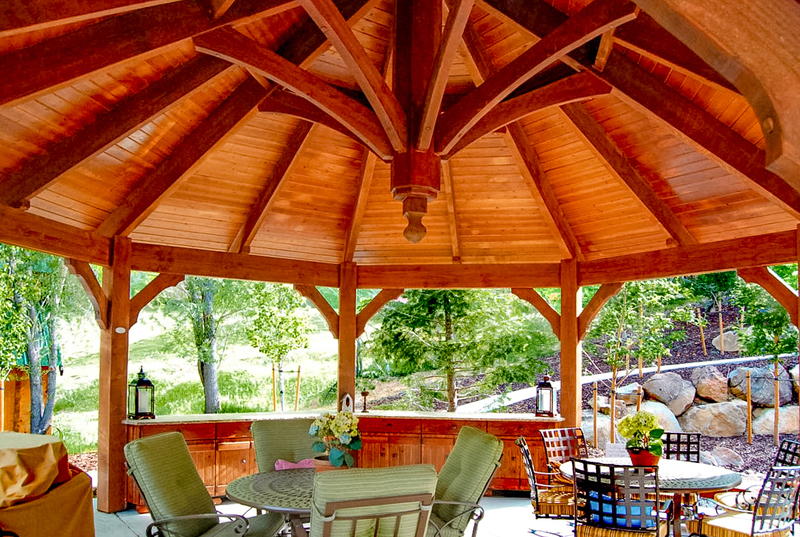 After enjoying the pictures below, check out more pergolas, garden arbors, gazebos or pavilion ideas created by timberwright artisans and see the beauty that lattices can add for a more comfortable shade in an outdoor family living area. 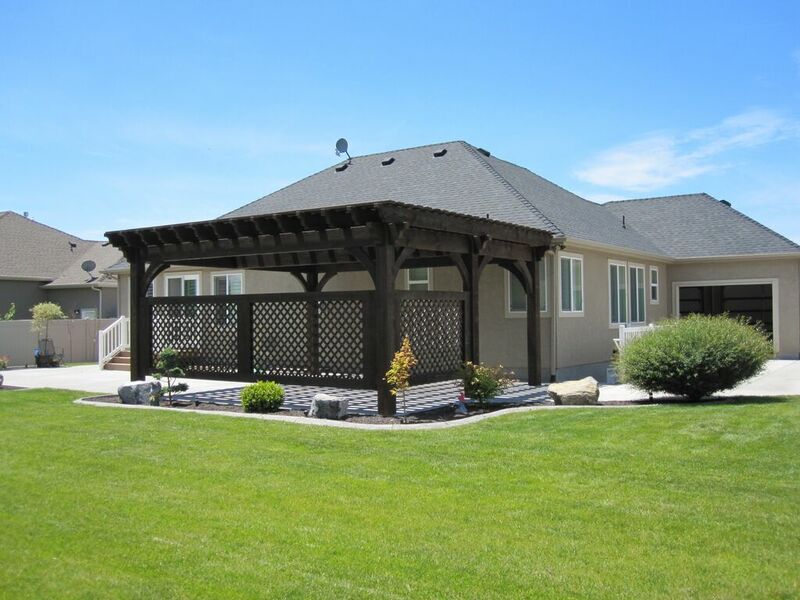 Back view of timber frame 8000 Series 20′ x 20′ ShadeScape™ DIY pergola kit with lattice half way across. 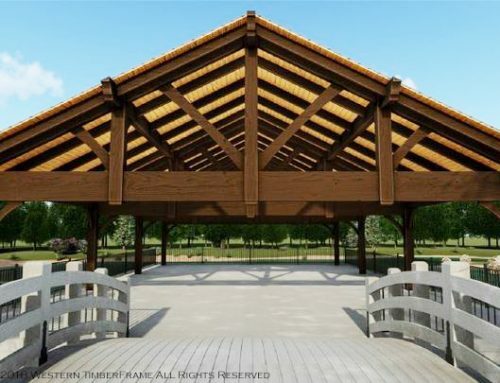 Picnic table with chairs and lounge chairs beneath the 20′ x 20′ solid wood DIY pergola kit with lattices using old world craftsmanship by timberwright artisans. 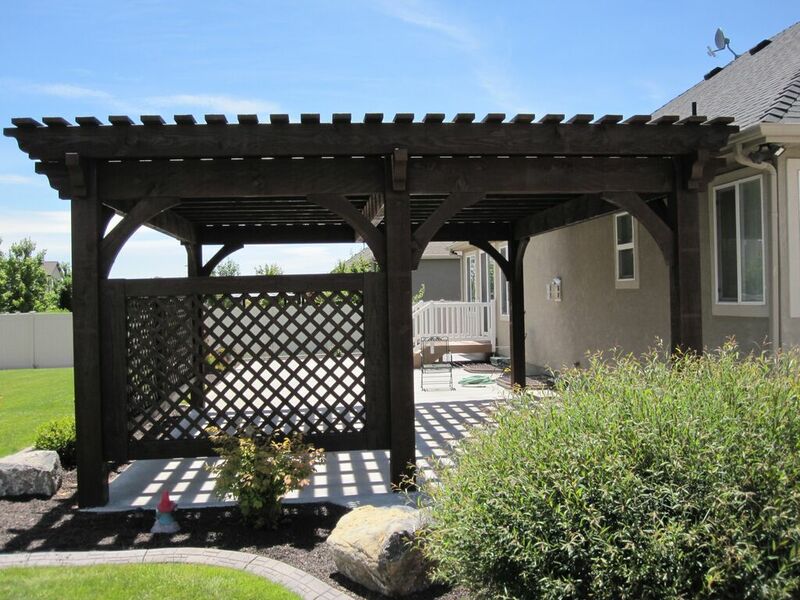 Three lattice panels on a 20′ x 20′ DIY pergola kit installed for a covered patio. 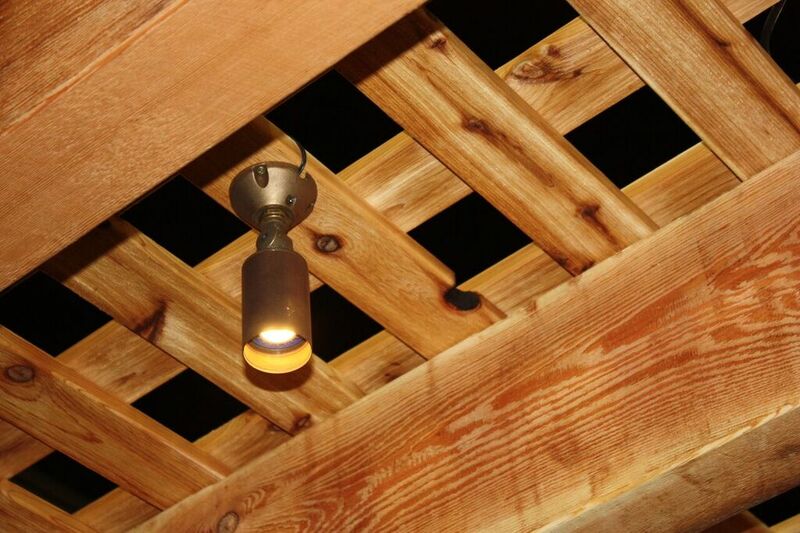 Up close lattice panels on a DIY pergola kit installed for shade over backyard concrete patio. 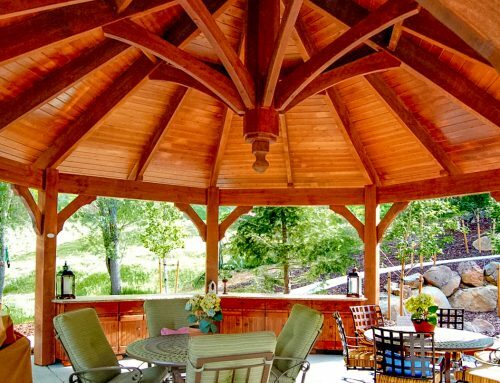 Old world craftsmanship by timberwright artisans in a DIY ShadeScape™ 8000 Series pergola kit installed for a concrete patio cover. Lounge chairs and metal outdoor furniture in the shade beneath the solid wood DIY pergola kit over backyard patio. 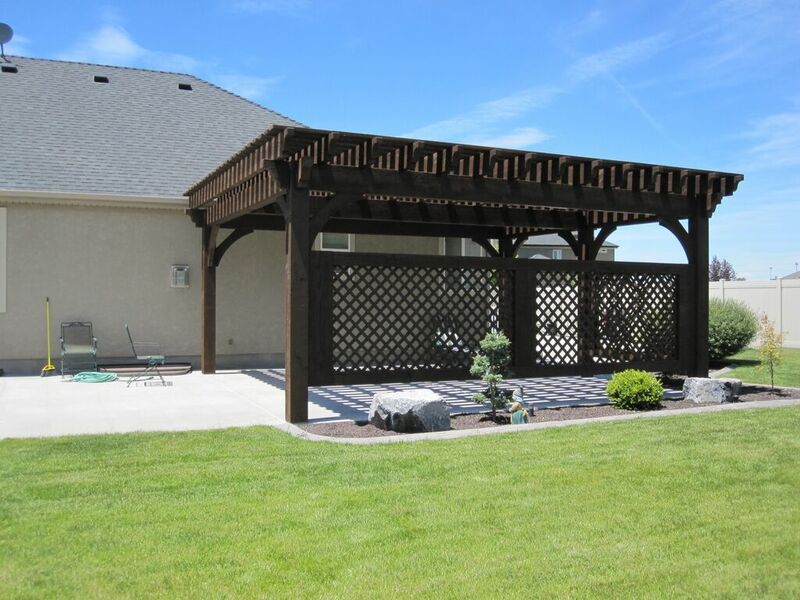 20′ x 20′ ShadeScape™ 8000 Series DIY pergola kit installed for a covered patio. 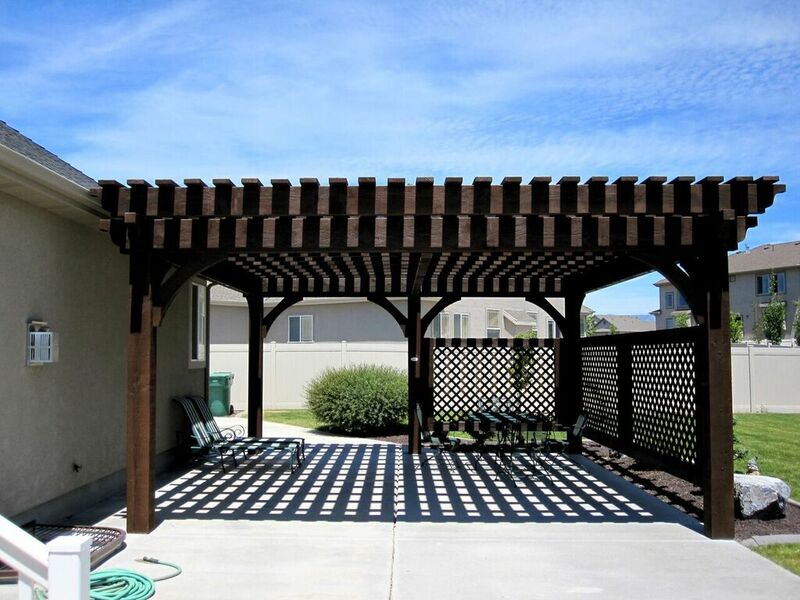 ShadeScape™ 8000 Series DIY pergola kit featuring five posts and lattice panels. 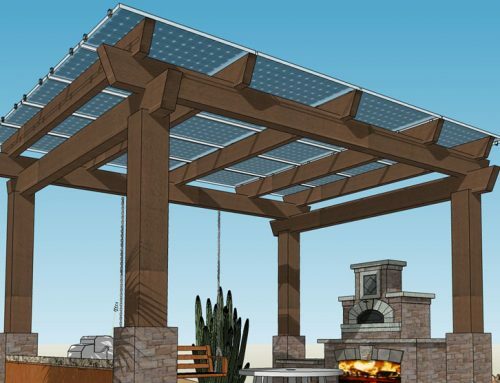 Stepping around the corner of the house to the ShadeScape™ 8000 Series DIY pergola kit featuring five posts and lattice panels. 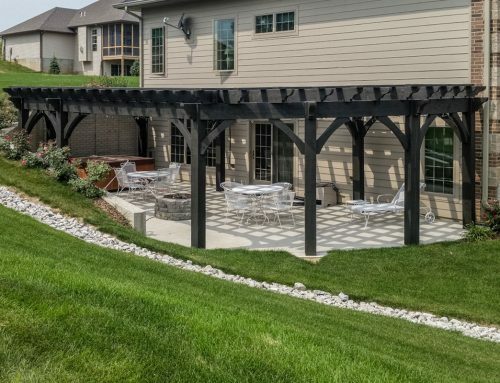 I would love more information on this 5 Post 20 x 20 DIY Pergola kit with lattice panels. How much do the 8000 series cost? Thank you for your interest. 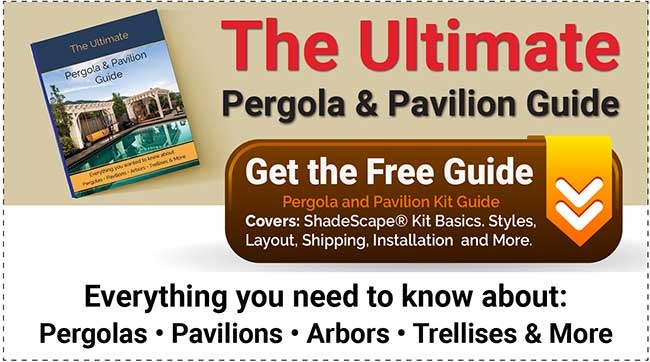 I have forwarded your info onto one of our Design Managers who can quickly give you any information you need on a 5 post 20′ x 20′ 8000 Series ShadeScape® DIY pergola kit with lattice panels. You should hear from them within the next 24 hours. They’ll get in touch with you via email asap. If you’d like to get an estimate immediately, give us a call at 801-331-6690 and ask to speak to a Design Manager. Thank you for your inquiry. I will have a Design Manager contact you with information and pricing on an 8000 Series ShadeScape® or if you like you can also give us a call at 801-331-6690 and ask to speak to a Design Manager. Have a great day. 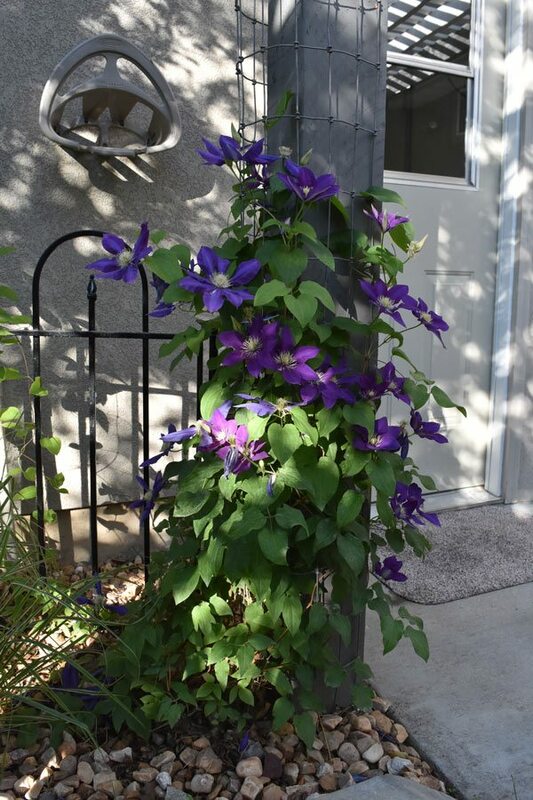 Love the look of your 20×20, 5-post. May I have a quote but without lattice panels? Hello Wendy, I have forwarded your request to a Design Manager. 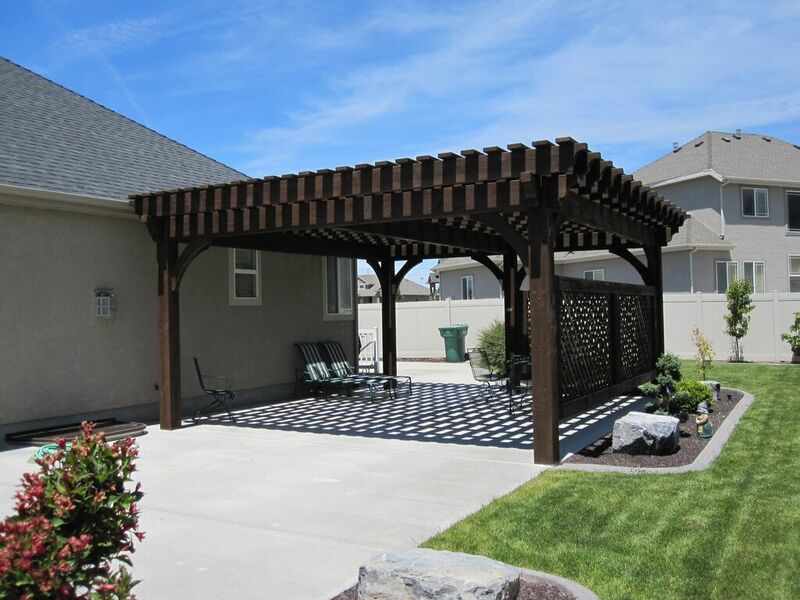 They can give you a quote on a 5-post, 20×20 pergola as soon as possible. Thank you for your interest. Thank you, Philip, for reaching out today and asking. We greatly appreciate this question we are often asked. It does seem easier for us and everyone if we could simply have listed pricing. Due to the custom nature of these kits varying widely in size and dimensions we don’t typically have a price list. Every kit is designed to your exact specs, landscape, wood type, size, etc. Of the 1,000’s of kits we manufacture, it’s rare that any two are alike, (as seen to our photo gallery on our website). That said, comparing a price of say, a kit of ours at $7,800, the average cookie cutter kit from a big box store costing between $800 – $2,000 and probably weighing somewhere around 200lbs – 380lbs, will have spliced beams, be limited in size, etc. Our kits weight in more than 10-30X that (2,500 – 10,000lbs), and are completely solid in their construction. 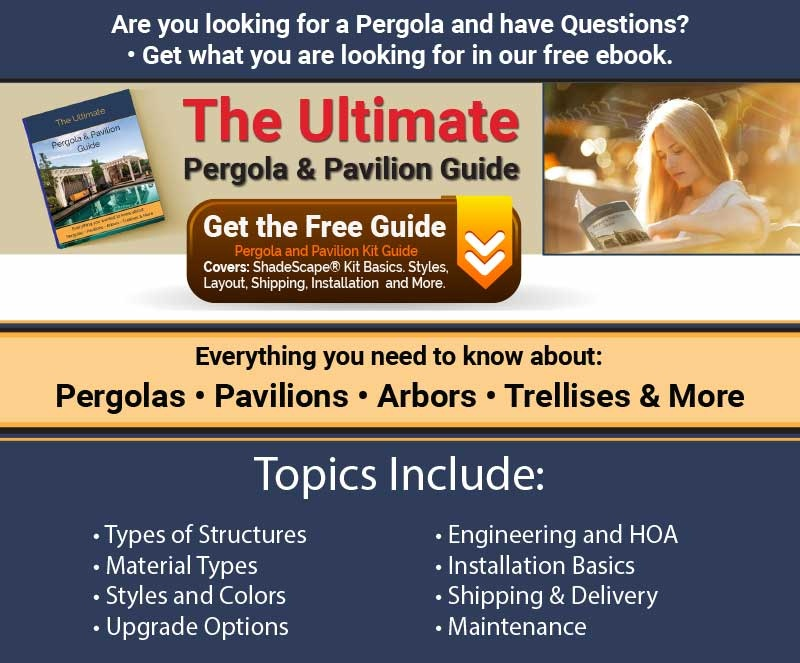 This is just one of the reasons we’re North America’s largest custom pergola and pavilion kit manufacturer. Also, as a benefit to our clientele, we also buy timber in bulk and whenever we are able to purchase a larger quantity and get a discount, we forwarded the savings directly to you. As such, we don’t post pricing on each kit because we adjust our pricing depending on the market price for our materials, and it would quickly be out of date. Note that you can easily get this weeks pricing on anything you see when giving us a call in just a few minutes. And, as a testament to our across the board 5-star reviews on all third-party sites regarding our customer service, this is a no-obligation quote. Again, we appreciate your asking, Philip. Have a wonderful morning.